Can you believe we are almost half way through May? With Spring blooms (and showers!) 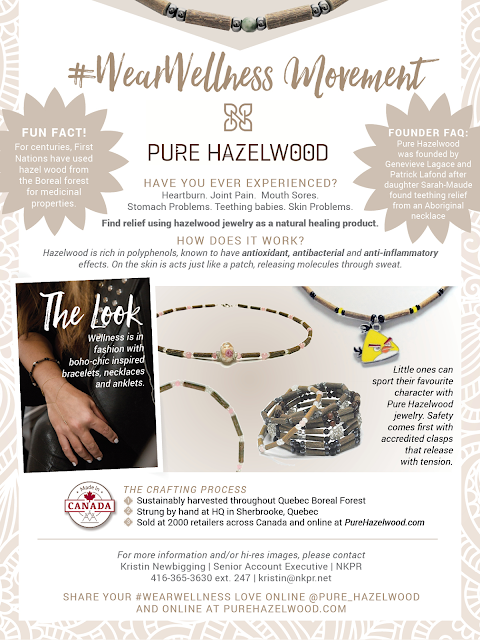 in sight, it’s the perfect time to put your health at the forefront and Wear Wellness with all-natural, holistic healing jewelry from Pure Hazelwood! The brand is all-Canadian from sourcing the Boreal-based hazelwood and manufacturing in Sherbrooke, Quebec. Founded by a husband and wife duo, it’s also completely sustainable and eco-friendly with best practices in place to harvest the healing hazelwood. In styles that speak to the boho chic vibe that warmer weather brings, Pure Hazelwood’s necklaces, bracelets and anklets come in sizes suited for any age, helping to relieve joint pain, skin problems, stomach aches, teething and more! I’ve attached one of our new flower-inspired styles! How does it work? Hazelwood is reach in polyphenols – known to have antioxidant, anti-bacterial and anti-inflammatory properties. It acts like a patch on the skin!